As I sat outside on Sunday, September 27th staring at the lunar eclipse, I began to wonder about that old ‘fact’ that says when there is a full moon you act differently. (Origin of the word lunacy anyone?) Could the movements of an object so far away from us influence our day-to-day activities? We already know from Sir Isaac Newton that the moon can affect our tides, so is it possible it can affect our behavior as well? Behavior, like many human attributes, can be difficult to measure. That being said, I had to narrow elements of behavior down into measurable variables. Even after doing that, there was simply too much information about different parts of behavior affected by the moon to process. I soon realized how impossible it would be to tackle more than one question about the lunar effect at a time. Because of this I have made the executive decision to divide this blog into two parts. The first part will look at the moon’s influence on criminal behavior. If human behavior is drastically influenced by the lunar cycle, it makes sense that there could be a notable increase or decrease in the amount of crime that occurs during a full moon. After some research it becomes clear that there are several studies examining this question. 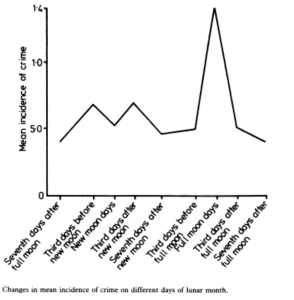 Image from study “Full Moons and Crime.” Graph belongs to C P Thakur and D Sharma. 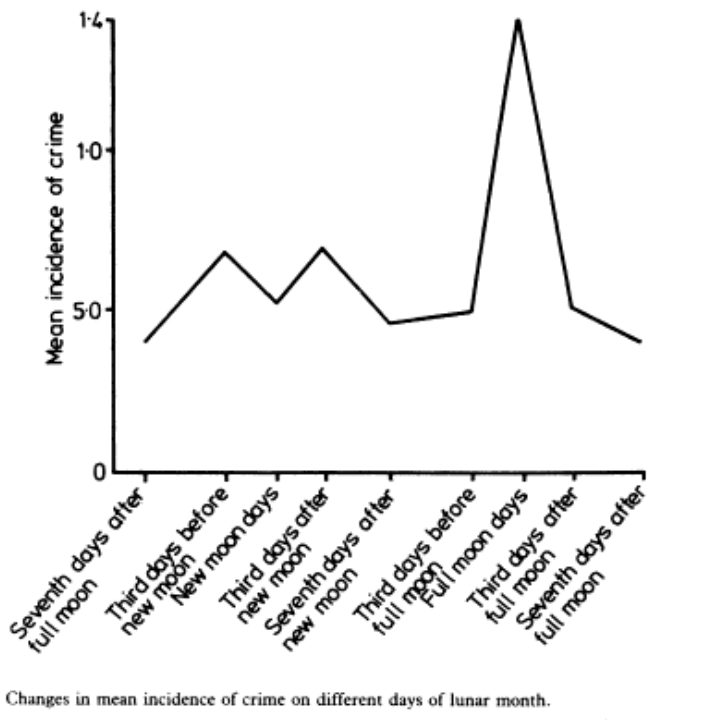 “Full Moons and Crime” is an observational study exploring crime rates in relation with full moon days. As with any observational study, the data must be looked at through a skeptical lens because correlation need not equal causation. . The study did incorporate some elements of experiment by randomly selecting 3 towns to observe. Assuming the randomization was done properly, those three towns should give a fairly accurate depiction of the population as a whole. The study took place over 4 years, which contained 133 full moon days, which seems to be a good sample size. The null hypothesis in this case is that the moon has no effect on crime rate and the alternative is that it does. 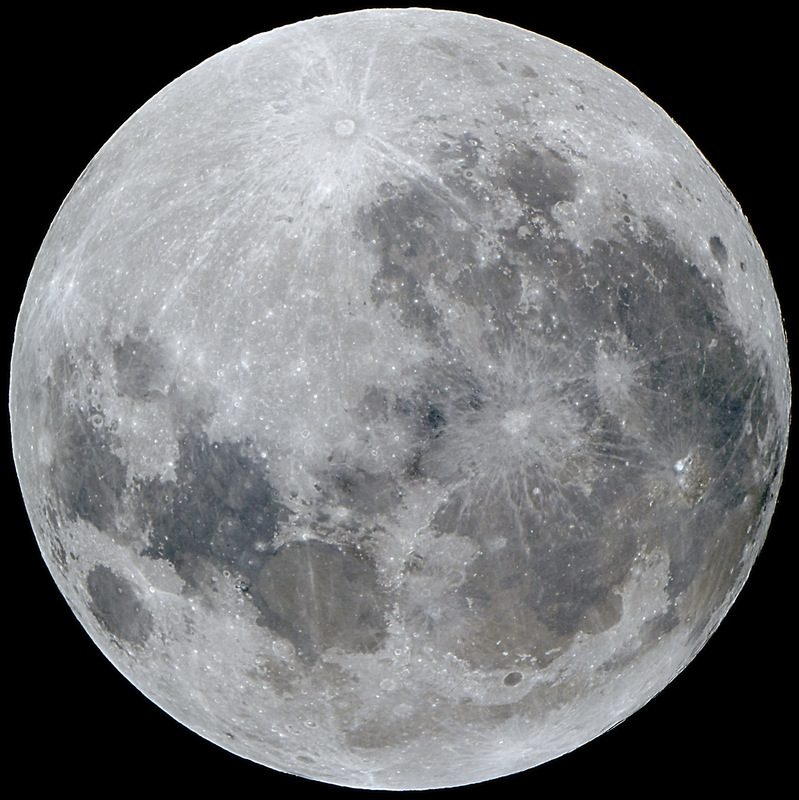 After careful analysis of all the crime records and what phase the moon was in when it happened, the researchers found a statistically significant difference in crime rates on nights when there was a full moon compared to nights in the rest of the lunar cycle. This evidence was strong enough that they rejected the null hypothesis in favor of a conclusion that the moon was influencing behavior. What does all that data mean? Basically, it means that there was significant statistical evidence that tied the full moon to increased crime rate. Unfortunately, this is an observational study that is extremely susceptible to confounding variables. For example, it may be easier to commit crimes when there is light provided by the full moon. In that case, the moon isn’t causing bad behavior, but is instead acting as a resource that inadvertently aids bad behavior. The good news is that reverse causation can be ruled out of this scenario due to nature’s laws. Regardless of what crimes humans do or don’t commit, the moon will still go through its natural phase shifts. Now the really big issue. Can this data be generalized to more than just the population of these small towns? Since the study took place in India, are Indian and American people statiscally similar enough to generalize this information? As we know from class, experiments are really the only way to prove that something causes something else. Unfortunately for us, there is no feasible way to perform an experiment on humans judging behavior when the full moon is out. Why? Because we can’t remove people from moon exposure to form a control group. It simply isn’t feasible to create an experiment without disrupting people’s lives completely. There are just too many variables that would require control. Because of this, we are stuck with looking only at observational studies. If We Can’t Do an Experiment, Where Does That Leave Us? Well we know that without an experiment, we can’t determine a casual relationship, so what happens next? The answer is simple. Multiple observational studies can help to support a correlation by reducing the possibility of chance correlations. We still aren’t able to rule out third variables, but at least we would know that the statistics hold up in other parts of the world. For example, in “Effects of the Full Moon on Human Behavior” (Click download PDF for the full text), researchers found that over a 1 year period of study in a large metropolitan area, 7 out of 8 types of crime, occurred at a statistically significant higher rate during full moon days than on a standard day. Homicide, the most serious crime included, was the only exception to this. Although this study doesn’t eliminate many of the problems discussed above, it does show that this phenomenon isn’t limited to just India. We still haven’t made in progress in determining if the relationship is casual because this study is also observational, but the evidence for some sort of relationship is piling up. So here’s the thing. Much like the depression and lights at night example talked about in class, it doesn’t matter why there is a correlation between the moon and increased crime rate, but rather that there is one. Even if the moon does not affect behavior, the truth is that two separate studies have shown increased crime rates during full moon periods. In my opinion, it costs more to ignore the correlation than it does to acknowledge it. Regardless of the reason, crime is happening more frequently on nights with full moons. This information should be put to use as quickly as possible when discussing ways to reduce crime. If putting a few more police officers out on full moon nights can prevent increased crime, then what is the harm in doing it? The potential benefits outweigh the consequences. It looks like there is no conclusive proof that the moon makes you act differently, but the data in the two studies above are consistent with that hypothesis. In both studies, statistically significant differences, with p<.01, were found in crime rates on full moon nights compared with regular nights. This leads me to believe that regardless of whether the behavior is caused by the full moon, appropriate precautions should be taken by law enforcement on those nights. Does the moon alter your behavior? Possibly. Do we have irrefutable evidence? Not even close. What do you think about the moon? Do you agree with my conclusion? Let me know in the comments below and keep an eye out for Part 2 of this blog series. UPDATE: Part 2 is now posted. Click here to read about the moon and investing. This entry was posted in Uncategorized and tagged crime, crime rate, moon, police on October 1, 2015 by Meghan Kelly Shiels.